The weather was magnificent today. It's a shame that I spent so little time outside. You might recognize this lovely from recent post, link. I'm glad that the votes are in and everyone is warming up to the idea of the new banner. "I'm assuming the old banner (which I also love) is of the Blue Ridge Mountains, where you live. So it's interesting that your new banner has a globe, which hints at a broader scope and perhaps represents the direction in which you want to wander." I'd have to say that it was my subconscious adding it's two cents. However unintentional it may or may not have been, it definitely holds truth. I have gotten a lot more comfortable with the idea of going to the places I have always dreamed of seeing. For now we'll stick with road trips eh? I love your very ZEN like qualities.. very soothing! I just wanted to say that I love how you give the tutorials I think it is wonderful that you are willing to share your time to teach a creative talent! I know I couldn't live without Photoshop or creativity! Oh and I forgot to add. About traveling.. ironically last night a painted a picture of a young girl traveling that fit very well with your blog. Since I am new I am not 100% sure how to post the picture in the blog but I will put it as my profile picture so you can take a look! And where are the places you want to travel??? Lovely words and photo - I need a road trip! prin: More mountains coming soon! Great Photo! I like the flower against the sky and the poem, nice work. Happy SWF! WW: A great flower to offset the Sky. FG: I agree, thanks for your visit! 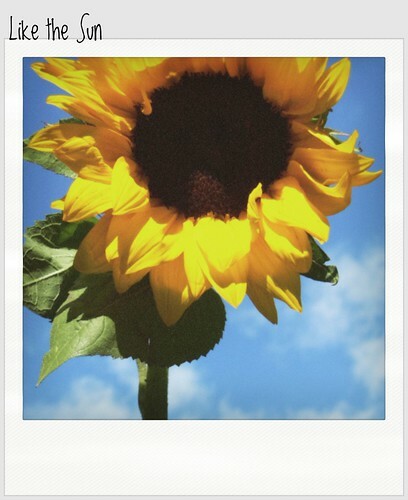 That's a wonderful sunflower against the blue sky. Gorgeous. Very beautiful image. Great composition and color contrasts! Well done! P.S. : Uh - almost forgot, please let your readers know, that it is a Skywatch post? Pretty please? (Yeah, yeah - rules - but we only got 2 1/2 of them - and you got almost a billion visitors through it. Your blog world is so beautiful! And love the vibrancy of your sunflowers!